Apple ushered in a new era for its Mac operating system Wednesday, choosing an entirely new method for distributing the OS X update. Mac OS X Lion arrived on the Mac App Store Wednesday morning. Apple’s online storefront for Mac software is the only place you can get the update now—though in August a $69 version on a USB drive will be available. The approximately 3.5GB download costs $30 and creates an Install Lion app in the Dock and Applications folder of systems running Mac OS X 10.6.8 or later. Once users double-click the app, the installation process begins. Not every Mac user will be able to upgrade to Lion. In addition to running the latest version of Snow Leopard—a requirement for accessing the Mac App Store—Mac users will also need to make sure they own Lion-compatible hardware. You’ll need at least a Core 2 Duo-powered system; Macs with Intel Core Solo and Core Duo chips lack the processing oomph to run the upgraded OS. That description will be ready apparent when users try out new features like Launchpad, a Mac-ified take on the app home screens found on the iPad, iPhone, and iPod touch. Launchpad displays the contents of a user’s Applications folder, showing every launchable app in a tiled list of icons. iOS’s influence over Lion is felt in other ways, too. The latest version of Mac OS X does away with scrollbars—they’re invisible by default as they are in iOS apps, appearing only when you start scrolling with a trackpad or mouse. Lion also continues to support more Multi-Touch gestures inspired by the way users interact with the iOS interface. Two-finger scrolling changes as well, with the new OS scrolling in the same direction as your fingers move. With more than 250 new features and enhancements promised in Lion, not every change in the OS X update mimics something you’ll find in Apple’s iOS. Some changes—like the new Mission Control feature, which combines Exposé, Spaces, and Dashboard into a single interface—enhance earlier OS X features. Similarly, Versions extends the operating system’s backup capabilities by storing earlier versions of files and documents while an Auto Save function records changes without anyone ever invoking the Save command. Other marquee changes introduced in Mac OS X Lion include support for full-screen apps, a new feature called AirDrop that simplifies file transfers between nearby Macs, and new versions of Safari, Mail, Address Book, and iChat. 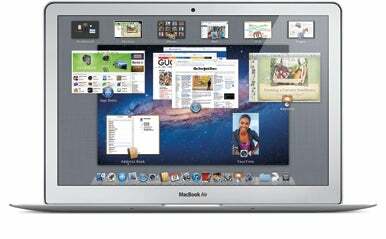 You can get a detailed overview and analysis of the latest version of Mac OS X in Macworld’s complete review of Mac OS X Lion. We’ll also post detailed looks at some of the major changes to Lion over the next few days—you can find the latest looks at the OS X update on our Lion home page.